OMG Posters! 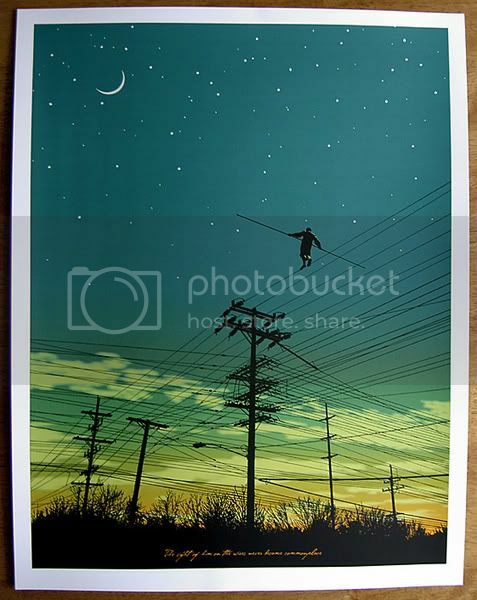 » Archive The Wirewalker Art Print by Mark Brabant (Hovering Object) - OMG Posters! I’m usually not a fan of artists taking on the whole power line motif, as there are already some established players in that style. But this new one by Mark Brabant, aka Hovering Object, is a fresh take, plus the print looks like it turned out looking gorgeous. It is an 18″ x 24″ screenprint, an edition of 150, and $35. To purchase, visit the Gigposters Classifieds. I REALLY LIKE THIS PRINT. DO YOU KNOW IF THE STARS GLOW IN THE DARK? I MIGHT END UP BUYING THIS, I WILL LET YOU KNOW MY DECISION LATER. I DON’T KNOW MAYBE IT’D BE MENTIONED IF THERE WAS GLOW IN THE DARK INK! I LOVE IT WHEN YOU ALWAYS TELL US YOU MIGHT AND MIGHT NOT BUY SOMETHING. I ALWAYS HOLD MY BREATH UNTIL THE ANNOUNCEMENT OF YOUR DECISION HAS BEEN MADE!!!!!! Dan, thanks, you made DIet Coke come out my nose. “the guy is blind, his stick is made of uncooked pasta and the trees beneath are full-o-snakes” made me laugh so hard. well done sir. btw i love the print. Your Comment, “forgot to mention that the guy is blind, his stick is made of uncooked pasta and the trees beneath are full-o-snakes” kills. Th print looks great. I removing my Nietzche book shelf to make room for it. Cous Cous – Ever thought about the fact that touching a power line will only kill you if you’re also touching something else at the same time? Walking on one might work, if you could get on one in the first place. On the other hand, falling and being caught by the (multiple) wires is instant crispy death. I had no idea power lines were so done . . . four artists constitutes as over kill? We might want to mention that to the people who paint flowers . . . Well I am just about to embark on a power line series nonetheless and I am hoping that the fact that my power lines are in the country and not so packed together and Australian lines too and water colours and the small elemental factor that I have never painted them before in my style backed by my concepts and processes might make it all ok . . . Yall had me questioning myself for a moment there . . . it’s ok I found some justification and will push ahead as planned . . . I do like the passion and random cleverness displayed in the comments here however and despite never posting in blogs . . . ever . . . I just wanted you to all know that I couldn’t help myself due to your level of greatness. . no matter how old and obsolete this thread may be, . . nor the small likely hood of anyone reading this, this late in the game. . . I’m impressed . . . That last point about the “instant crispy death” . . . Gold ! emoreth . . .